Motor Neurone Disease (MND), sometimes referred to as Amyotrophic Lateral Sclerosis (ALS) or Lou Gehrig’s disease, is a neurodegenerative condition that affects the motor neurons that reach from the brain to the spinal cord and affect muscles throughout the body. As these motor neurons deteriorate, the brain’s ability to initiate and control muscle movement is lost. Most often, the condition affects people between the ages of 40 and 70. It is estimated that as many as 30,000 Americans are affected by the disease at any given time. 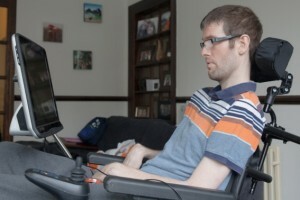 For individuals with MND, it is important to have the tools needed to maintain independence as abilities change in response to the condition. Muscle weakness in the hands, arms, legs, or in the muscles that control speech, swallowing or breathing, exclusively or in combination. Muscle cramps or twitching, especially in the hands and feet. Impaired use of arms and legs.